Fed up with the rain, grey skies and cold or just want to plan your next exciting adventure? Why not book yourself some singing and autumn warmth. Join me for a truly special cultural and singing experience at an award winning, comfortable, sustainably-run traditional guest house based in the ancient walled market town of Taroudant – in the fertile Souss Valley between the High Atlas and Anti-Atlas mountains. Booking and expression of interest directly through Holidays with Heart – www.holidays-with-heart.co.uk. We will sing each day in the beautiful cool setting of Maison Anglaise and then you can enjoy a range of cultural visits and activities supported by excellent local guides exploring the culture, landscape, wildlife and history of the area. Options to trek or laze in the sun! 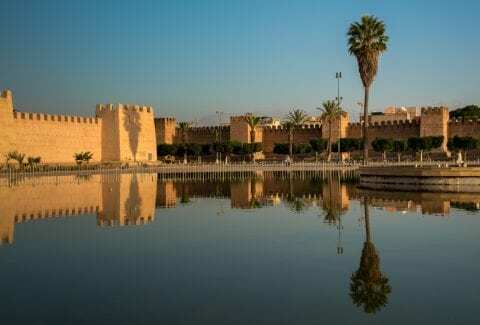 The home is run by a team of English-speaking Moroccan staff with years of experience of running group holidays. Food is local and healthy – substantial breakfasts and vegetarian evening meals (option of meat or fish for small supplement – special diets catered for). Pre holiday support and information from the knowledgeable staff at Holidays with Heart. Cost includes accommodation, breakfast and evening meals, 2 cultural excursions, all teaching, a “Feast for the Senses” celebration, airport transfers to/from Agadir. It does not include flights, lunches and travel insurance. Limited places available. Book early to get good flight prices, but please do NOT book flights until they give the go-ahead!